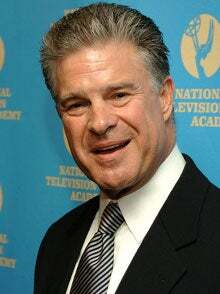 In a San Diego court yesterday, waxen HBO broadcaster Jim Lampley pled no contest to violating a restraining order against him filed by an ex-girlfriend. She claims that Lampley threw her against walls a door in their hotel room on New Years Eve, and for a former Miss California, being thrown against a wall by Jim freaking Lampley is a sorry fate indeed. Lampley will receive probation and must undergo a 52-week domestic violence rehab program. He doesn't appear to have much remorse about the whole matter. "The thing that I am most guilty of is choosing (the) wrong woman," Lampley said. Seriously, yo: Miss New Jersey totally would have not made a big thing about the whole "bouncing off the walls" business. We wish Lampley the best of luck in finding a woman who understands that he is Jim Lampley, and Jim Lampley is not someone with whom to be trifled.